Anyways, this should be a day to celebrate life, but you know I always go against the grain. A couple days back I felt led to open up and share some of my family history (or should I say people who passed). The point of that blog was to recognize the importance of relationships. Well today I have a little twist. I want to write about funny things that happen during that period of time people pass away. I mentioned two instances briefly in that blog, but I just wanted to expand on them. STORY I – I will start with my mother-in-law. They have a small church (to paint the visual), so not really anyplace you can hide. So this woman gets up to sing, right. Let me pause. 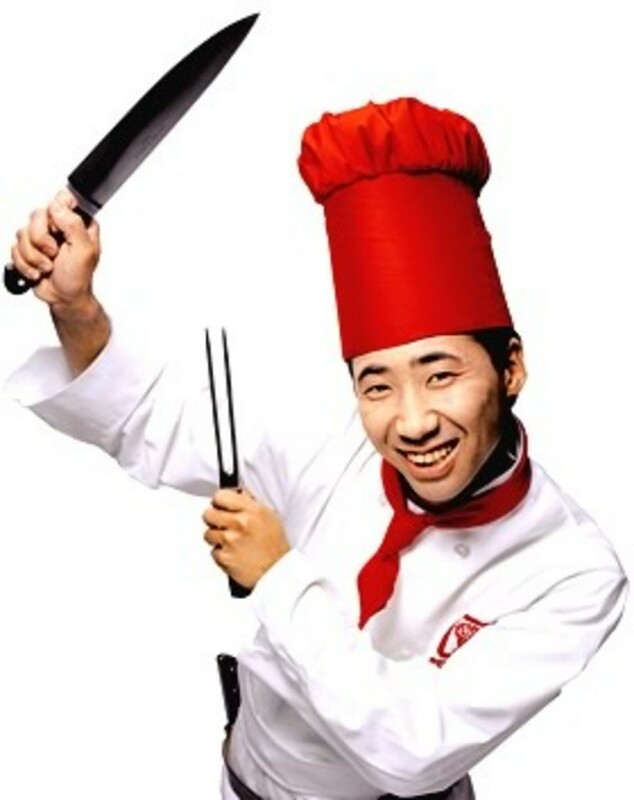 Have you ever been to a Hibachi restaurant, and the guy is slicing and dicing? He is chopping all fast, spinning stuff on the blade, blowing fire, doing tricks. Ok, keep that in mind. Back to the funeral. The lady starts the song and…the best way I can describe it is taking a piece of paper and ripping it down the middle. You know how it never really tears straight. Well her voice was one side of that paper, and the music was the other. They were going in two completely different directions and didn’t coincide whatsoever. I mean literally, if those notes were physical items, she would be like a Hibachi chef. She was throwing notes up in the air – slicing, and dicing, and spinning. It was like Benihana was on the mic. I wouldn’t even call her tone death. Can’t give that much credit because even a monotonous hum had more range. Ok, my intentions aren’t to be mean towards her, but I am trying to paint a picture. Poor thing (bless her little heart). I had to just keep kissing the back of my sons head to keep from cracking up. She butchered that song something terrible. STORY II – Now that was bad, but this was worse. My mom’s funeral was at our home church. Nice size church. So the family is sitting down front, and the music begins to play. Let me back up. We went through ALL kinds of drama getting the program together because everybody and they moma wanted to sing. I mean it got so bad they literally had a song festival the day before with nothing but singing for 4 hours because that is how many songs they chose (an event I refused to attend because their hearts weren’t in the right place). Anyways, when I was doing the program and when they were throwing songs out there, I chose Going up Yonder. One of my (many) favorite songs growing up, and figured that choir couldn’t tear that song up too bad. My sister and the other woman (who both still attend the home church) were talking about this guy Michael who would sing. I didn’t know him, hadn’t visited that church in about 5 years (10 prior to that), so I just took them for their word. So the funeral gets there. Of course I am an emotional wreck. Thought I could hold it together, and cried like…I can’t even explain. Not a boo-hoo cry, but like every tear in the reserve for the past 11 years just poured out silently. I think at this point they already closed the casket and service started, and you know how you have that wierd feeling after you cry. Like a suspended state of euphoria? On one hand you still hurt, but the other you feel cleansed. Almost makes you feel like you are going crazy. So I am playing with my sons, trying to smile and not make this a horrible moment for them. I had my head down talking to them (I will never forget this). The music starts, and I hear this high pitched, Maxwell type soprano squeal. I look up, and my first thought (Lord forgive me for this)…my first thought was – Aw, hell naw! Ok, how can I describe this dude. 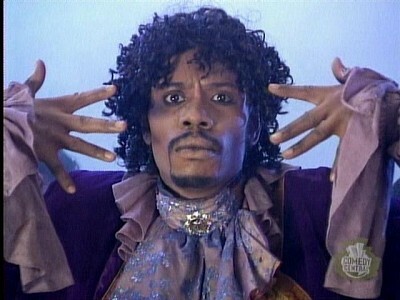 I swear he looked like the illegitimate love child of Prince and Little Richard. Once again I was like what the hell man. I could at least give him some props if he could sing. I mean everybody knew tax evasion Wesley could probably kick Michael Jackson’s tail in BAD, but we still respected Mike cause he could hold a tone, and do his thing. But this cat at the funeral purely stunk, and he looked like he should be holding a plate of pancakes. I think I started chuckling because I couldn’t believe how bad it was. My wife knows I am a goof ball, so she tried her best not to look at me because once I get started, game over. I was just waiting for him to say – This bores me. Is anyone up for a game of basketball? How about you and your friends… versus me and The Revolution? Ok, that is enough for now. How about you? What are some funny things that happened (if any) at the funeral, or during that time? Man not Lake Menatonka Prince…hahaha…man I don’t remember alot about my wife’s funeral, because I was…I guess on another level…but it was this one cat. Okay, real quick…my wife’s funeral was in early April…it was a beautiful day…It was this one cat there…dude looked like a black Oscar the Grouch…better yet, Fozy Bear with glasses…I just wanted to give him a hairline. I guess you would have to say that God got jokes cuz the things that happen at funerals, wow. I have 2 quick stories (same funeral). My paternal grandmother died when I was about 7-8. I will never forget it. Her sister was sitting in front of us and during my grandmother’s fav song she stood up on the pew and started screaming, “Wait, Ruby I’m coming with you.” I mean like Fred Sanford for real. It was hilarious. Then, at the grave site my crazy aunt jumped on the casket. I couldn’t believe it. I remember thinking, please lower it in the ground and take this nut out her misery. I am telling you I have experience some of the same things. I try and think like this is a funeral and at least their hearts were in the right place. Why in the heck would you get up there and butcher a song? I wish I could have record the lady trying to sing Marvin Sapp. It was truly classic, my grandmother would have even cracked up if she was living…LOL.